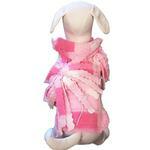 Your princess pup will face the cold with grace and beauty with the Baby Girl Fleece Dog Jacket by Cha-Cha Couture. The Baby Girl Fleece Dog Jacket is like wrapping your fury baby in a baby blanket. This darling lightweight jacket features a super soft pink fleece with an adorable pink patch print pattern. This soft fleece jacket for dogs is easy to apply with touch fastener at the neck and chest. 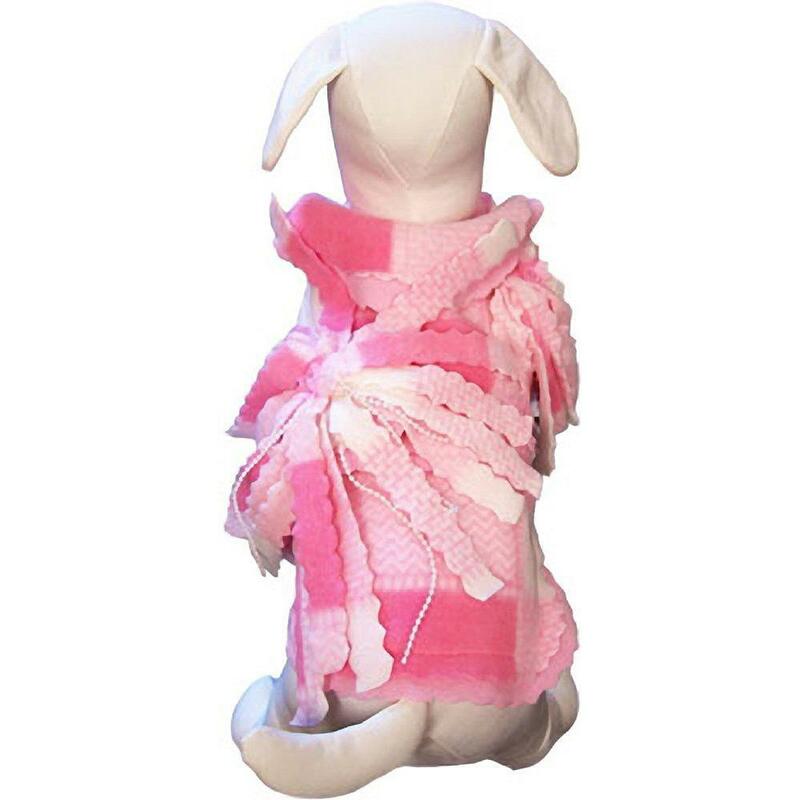 This unique design features a scalloped raw edge with two layers of fleece to keep your pup toasty with a decorative corsage made of fleece strands and pearls. This toasty dog fleece is perfect for Valentine's Day, chilly spring mornings, or an Easter Egg hunt. Baby Girl Fleece Dog Jacket by Cha-Cha Couture Customer Photos - Send us your photo! Lisa Marie, “Pretty in Pink”, in her fleece jacket from Baxter Boo. ?? Posted On 11/05/18 by cynthia h from Terre Haute, IN Yes, cynthia h recommends this product! This dog jacket is so soft you will love it! Miss Molly wears a size Large which fits her perfectly. It is very lightweight and feminine. Such a great bargain at this price. Posted On 06/27/18 by Lauren H from Allentown, PA Yes, Lauren H recommends this product! super cute love that color pink its so cute and different in a good way, my dog is now 10 lbs Morkie medium fits her great. It is very cute but much too small for my Shichon. I am debating about sending it back because then I will have to pay shipping. I would order it again but then I have to pay shipping. Do you see a pattern here? It's a shame you do not take even exchanges and charge shipping which would probably cost me as much as the coat did at the time. Posted On 03/11/18 by connie b from Waynesbvoro, VA Yes, connie b recommends this product! Posted On 03/04/18 by Laurie H from Allentown, PA Yes, Laurie H recommends this product! So soft and warm, very cute on my dog. Posted On 02/22/18 by Lauren H from Allentown, PA Yes, Lauren H recommends this product! Love your sale I picked a medium for my 10.5 lbs Morkie. Looks cuter in person this adorable fleece jacket has 3 little flowers it is very soft and cute. I have raised basset hounds for 29 years. I currently have 5 of them. One of my young female bassets has "droopy eyes" . I knew this would/could be a serious problem for her during the Spring and particularly the summer months, possibly causing the moist membranes around her eyeballs to get sunburned. I was corrected to be concerned as that they are already becoming irritated by the sun. Took a chance and did an online search for "doggie sunglasses and found BaxterBoo.com. I am looking forward to giving Lily a chance to be outside with the other bassets without suffering for days afterward. I will be telling all my friends about Baxter Boo! Thank you for making a complex issue easy to remedy!